Genbook makes it easy to open up or scale back availability on the fly and account for last-minute changes, without disrupting your weekly schedule. Say you want to work on a particular Tuesday, even though you are usually off on Tuesdays (based on your Staff Hours). Or say you want to make yourself unavailable for portions of a particular date, without affecting your overall weekly availability. We have you covered! 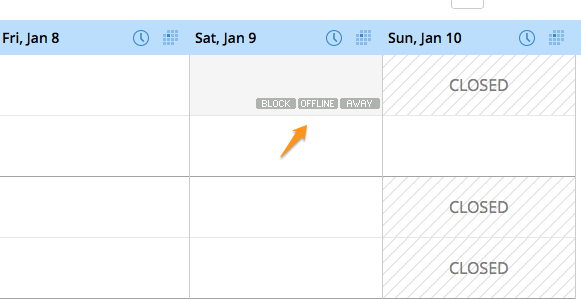 When you hover over an "Away" time slot, you'll see two options in addition to that of creating a Block: "Online" and "Offline" (when you hover over an Offline time slot, you'll see the options "Away" and "Online", in addition to "Block"). 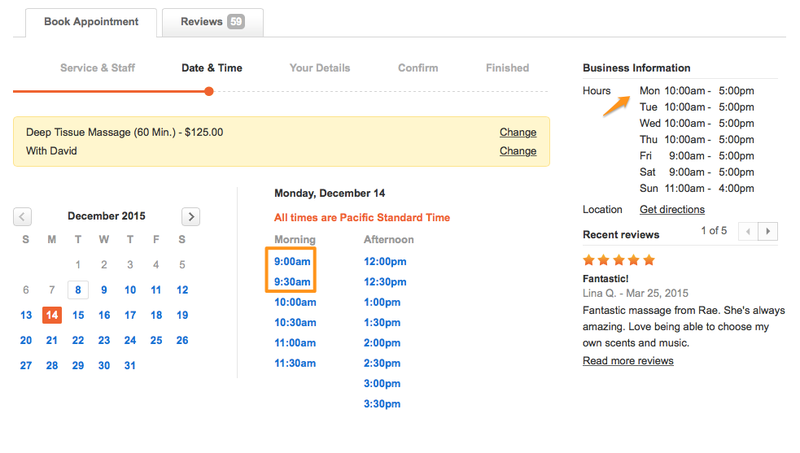 Click "Online" to open the slot up so your clients can have the option to book it. Do so for as many time slots you wish to open up on that particular date. And, of course, you can mark yourself as either "Away" or "Offline" when you're otherwise scheduled to be Online (ie: available to take online appointments). This allows you to make yourself unavailable for appointments at times when you normally would be able to take them. 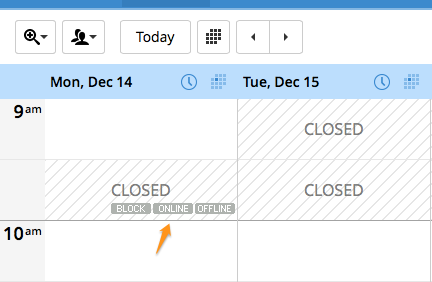 It's even possible to override Closed times directly in your calendar, without having them affect your Operating Hours. Just hover over a "Closed" time slot and click "Online". In the example above, we made staff member David's 9:00am and 9:30am time slots Online, even though our business is closed until 10:00am. The result of the override we did above is that David can take an appointment outside of the business's regular hours.